The number of small businesses that invest in building a mobile app is growing steadily. 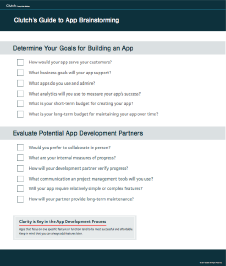 This comprehensive guide covers choosing a development partner, monetizing an app, and developing a marketing strategy. More than 40% of small businesses have a mobile app, according to Clutch’s annual Small Business Survey. That number may increase to 67% by the end of the year. As companies increasingly invest in mobile apps, they find that there are multiple options for building an app, and this can make it difficult to understand which option aligns with their goals. To date, Clutch has reviewed 3,400+ leading mobile app developers and surveyed 102 app developers from firms around the world. We gathered everything we learned into a step-by-step guide to making an app, including pros and cons of each option. Use this article to explore the app-making process and learn how to take actionable steps toward making your app idea a reality. Before you commit to building a mobile app, experts recommend that you articulate how the app will help your company. To kick off the process internally, it’s important to make sure your vision for the app aligns with your audience’s needs and supports your business goals. These reasons for building an app contribute to a central goal: Apps allow businesses to forge closer relationships with their customers. How will your app serve your customers? What apps do you use and admire? What business goals will your app support? What analytics will you use to measure your app’s success? What is your short-term budget for creating your app? What is your long-term budget for maintaining your app over time? When setting the budget for your app, consider three factors that affect the cost of making an app: development, marketing, and maintenance. The type of app development solution or partner you choose impacts cost. Instead of choosing a partner first, identify a budget and allow it to guide your choice of an app development option such as DIY software or a development agency. The cost to build an app varies significantly, and app features are a key factor in determining the cost of a project. For example, push notifications can range from less than $5,000 in added cost to as much as $50,000-$100,000, depending on the specific project. To keep the budget from ballooning and your app from becoming overwrought, experts recommend that you choose one or two essential features your app must have. From that starting point, you can always add features later. For example, Uber has added features such as a ridesharing option and meal delivery service in recent years, well after the app initially launched. To build a sustainable app that generates revenue, you may need to dedicate one of your existing marketing team members, or expand your contract with a marketing agency to help market your mobile app. With Apple’s App Store alone on track to reach 5 million apps by 2020, so it will take consistent marketing effort for your app to gain traction. If there’s one area where companies fail to budget for an app, it’s maintenance. After launching an app, be sure to budget for changing security needs, new best practices in user experience and design, and overall maintenance. By accounting for maintenance costs from the start, you can begin the long-term planning you will need to drive your app’s success. Mobile apps fall into two broad categories: hybrid and native. Your budget and the functions you need the app to perform will help you determine which option is right for you. Hybrid apps are best for content-heavy apps, while native apps are best for complex consumer apps requiring high standard of UI/UX. Low Cost: By bypassing custom development, hybrid apps are significantly less expensive to create. Simple Functionality: Hybrid apps need to be simple to be effective. If your users need functions beyond browsing web-hosted content, you will likely need a native solution. Slow Speed: When you use a hybrid app, each element of the content must be downloaded from a website. This means that hybrid apps tend to run slower, and they can’t be easily accessed from an offline device. Native apps are built for a specific platform such as iOS, Android, or Windows. Games or apps requiring complex device functionality require native design. Overall UX: Native apps are custom built for a specific operating system. They tend to be more reliable and can support more sophisticated features. Fast Speed: Native apps store text and graphics internally. This means that your app will retain greater functionality even if your users’ devices are offline. High Cost: Native apps cost more to build and maintain because you need to develop multiple versions of your app for various platforms. For some companies, building an app is part of a long-term strategy for developing an additional revenue stream. However, the days when app users paid to download an app are largely over. Consider which model for monetizing your app makes the most sense: freemium, subscription, or premium content models. 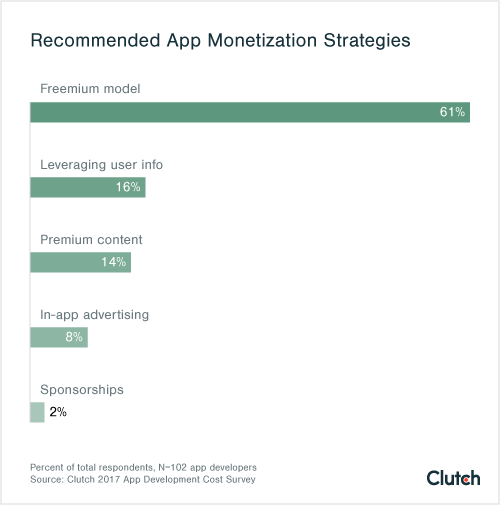 More than half (61%) of app development companies recommend monetizing an app using a “freemium” model in which an app can be downloaded for free, and users are later offered paid upgrades to access additional features or the opportunity to make purchases in the app. The freemium model has become dominant because users appreciate the opportunity to test an app before committing to payment. For example, some audio recording apps offer a limited amount of storage for free, with the option to upgrade once users reach the maximum. If users run out of storage space, they are more likely to pay for an upgrade. Another popular strategy for monetizing an app include a subscription model used by companies such as Spotify. In the subscription model, users pay a recurring fee to access advanced features within the app. In Spotify’s case, this means users access unlimited, commercial-free music that they can stream offline. You may find success by providing premium content through your app. Because most users prefer to try an app before committing to pay, premium apps work best for companies that are well known for providing a particular service. 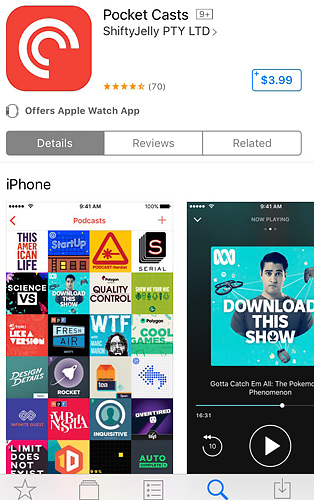 For example, Pocket Casts is a podcast app that costs $3.99 for both Android and Apple users. The niche community of obsessive podcast listeners who keep up with dozens of shows or who have strong listening preferences may be willing to pay for an app that gives them greater control over their podcast experience. Although it’s possible to earn revenue through ads within your mobile app, in-app advertising has largely fallen out of favor among users who find advertisements distracting and spammy. Sponsored apps are a more appealing but expensive option and operate like other sponsored or native advertising content. For example, Marriott sponsored an app that featured original restaurant reviews by professional critics instead of using an in-app banner ad. By sponsoring premium content that is comparable to high-quality apps users already enjoy, Marriott integrated its brand seamlessly into its content rather than using in-app ads that are likely to distract users. However, because successful sponsored app campaigns require a substantial budget and extremely strong brand recognition, they are not recommended for most companies. In this section, we’ll outline the pros and cons of each option for developing an app to help you determine the best match for your business. Definition: Software that guides you through the process of creating an app yourself. Made For: Small businesses, entrepreneurs, or individuals who want to create a simple app but do not have coding experience. Not For: App development projects that require complex features or custom coding. Software companies developed app builder software that helps small businesses build mobile apps from start to finish. Like popular website builders such as Squarespace, DIY app builders provide a simple drag and drop interface that allows you to build your app without knowing any code. Once the app is ready, app builder software also guides you through the process of listing your app where users can download it. Andrew Gazdecki is CEO of Bizness Apps, an app software platform targeted to small and medium businesses. His clients use the Bizness Apps platform to build apps for their small businesses, ranging from local restaurants to real estate agents. In a conversation with Clutch, Gazdecki pointed out three benefits of using an app builder. First, DIY solutions are budget friendly. “We’re able to offer typical mobile app development at almost one-fiftieth of the price of a custom developed app without losing any quality,” said Gazdecki. Second, some DIY app builders offer long term maintenance support and updates. Third, app builder software allows you to develop an app quickly and easily. Despite these three benefits of DIY app builders, the software is not for everyone. “The most common pitfall we see is when people do not set the proper expectations when using Bizness Apps,” said Gazdecki. Like any other tools that work off pre-built templates, DIY app builders offer a robust but ultimately limited selection of design themes and features. If you need to customize your app’s design or features, you’ll likely need a programmer. Definition: An app development firm located outside the US. In the onshore/offshore model, some US-based firms also offer development services from an offshore staff as a cost-saving option. Made For: Companies seeking a cost-effective partnership to develop an app with familiar or popular features. Not For: Companies seeking in-person collaboration. 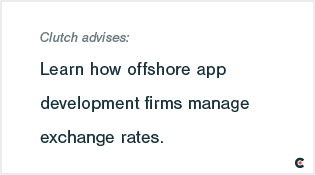 For American companies, choosing an offshore partner can reduce the cost of building an app. This option is best suited for companies aiming to build an app with familiar features that are already popular in the marketplace. Manoj Balraj is Vice President of Experion Technologies, an app development firm based in India that has worked with companies in the United States, Europe, Asia, and Australia. No matter where clients are based, Balraj finds that expectations for user interfaces and experiences are universally high. Working remotely presents certain challenges that are unique to offshore firms. Fortunately, most offshore firms are adept at guiding companies through the process using communication and project management tools. Time zone differences represent the first challenge most people think of when considering an offshore firm, a fact that offshore firms openly recognize. “There is a risk of losing days if there is no discipline in the communication,” said Garkavyi. Fortunately, offshore firms typically are adept at managing time zone calculations and often use scheduling tools that automatically calculate time zone differences. 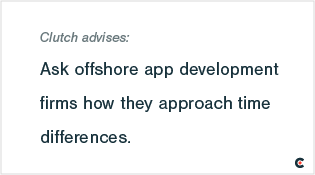 In most cases, it’s recommended that companies select an offshore app development firm in a time zone that overlaps their work day by at least several hours to avoid delays. Experion Technologies solves this problem by scheduling its teams’ work during the approximate business hours in a client’s time zone. “People don’t come in and leave at the same time, but their timings are aligned so that there will still be a couple of overlapping hours,” explained Balraj. Most of Balraj’s clients understand that although Experion Technologies’ team can’t be available around the clock, they are able to work around time zones by being flexible about the beginning and end of their business day. For kickoff calls and the ideation phase, it’s important to find a time to arrange a video call if an in-person meeting isn’t possible. The development phase presents different communication needs. Garkavyi points out that when Intellectsoft works across a 9-12 hour time difference, it typically delivers results as their clients are waking up. Communication tools such as Basecamp, Slack, and Skype, along with frequent video call check-ins, help maintain open lines of communication among collaborating teams. Managing payments across borders may seem daunting. But just like managing time zones, offshore companies have strategies in place that take the burden off their US clients. Experion Technologies maintains offices and bank accounts in multiple countries, directing all transactions through a bank that is local to their clients and handling exchange rates internally. “All the invoicing happens in the local currency, so there is no hassle or confusion on the customer’s end,” said Balraj. For areas where Experion Technologies does not maintain a local bank account, including parts of Africa, they have partner companies based locally that handle exchange rates on behalf of the client. Just like boutique or local development partners, the ideal collaboration with an offshore firm involves ongoing dialogue. By the time you approach an offshore app development partner, you should have a clear sense of your business goals for the app. From there, the development partner can offer the technical expertise to develop the app, often offering time- and cost-saving strategies along the way. Frequent communication, visibility on how your business functions internally, and insight into how you plan to launch the app ensures that everything goes smoothly, from the app development process, to internal employee education about the app, to how customers are primed to receive and use the app. It’s important to remember that just like looking for a local partner, not all offshore firms are created equally. On occasion, Balraj has had potential clients reach out to ask if Experion Technologies can match the cost of app development offered by another development firm in a different country. For companies seeking a cost-saving solution for building an app, offshore development partners can be a strong solution. Offshore firms’ experience handling time zone and currency differences remove obstacles, leaving companies free to collaborate and focus on the app development process. Definition: Small app development firms located exclusively in the US. Made For: Companies seeking an app development partner for in-person collaboration on a complex app. Not For: Companies with a small budget. A local or boutique firm is an app development company that focuses on custom app development and has a limited number of employees. The main benefit of opting for a local or boutique firm is the ability to collaborate in-person. “You don’t have to be in the same city as the whole team, but it’s nice to have a main point of contact that you can sit down with and iron out details,” said Randall Cross, Founder of Ethervision, a Chicago-based app development firm. Ethervision arranges in-person meetings during the ideation phase of app development. Conversations range from formal meetings to spontaneous late-night brainstorms over cocktails. “Getting everyone together and having that camaraderie and seeing facial expressions is the best way to go in the ideation phase,” said Cross. When it comes to the development phase, it’s less important to meet in person. Communication tools such as Slack and screen sharing can keep a company and an app development partner in constant communication, especially once the foundation of a relationship has been set. A strong foundation is crucial because mobile app development is a long-term commitment. Apps like Facebook are typically updated weekly. 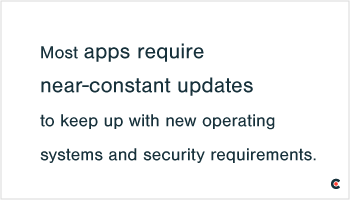 Although less frequent updates are sufficient for most small businesses, updates to mobile operating systems, best practices in user experience, and security practices make periodic updates a vital aspect of maintaining a mobile app. By building a collaborative, long-term relationship with a boutique or local partner, you’ll be able to enjoy the best part of the app development process: thinking creatively. “Making an app is as fun and cool as it sounds,” said Cross. Cross finds that the most successful mobile apps come from partnerships with companies that are enthusiastic about collaboration. By remaining open to conversation and collaboration, you can ensure that your app gets combines your vision with a boutique firm’s expertise. Definition: Large team of app developers capable of delivering apps with complex features that anticipate a high volume of data and/or anticipated users. Made For: Enterprise-scale businesses developing complex apps that will serve as a key touchpoint for customers. Not For: Most small businesses. If you are part of an enterprise company seeking a mobile app with complex functionality and the ability to scale for an extremely high volume of users, you need to find a partner with a development team equipped to handle these challenges. Tobias Dengel, CEO of WillowTree Apps, and Gregory Raiz, CEO of Raizlabs, both built their businesses around building large scale apps for enterprise clients. Over time, they’ve identified the keys to collaborative and effective relationships. At the beginning of a partnership, it’s important to identify a single goal for the mobile app. For example, Uber was originally designed for easy transportation, while Snapchat was originally designed for ephemeral photos. Over time, both apps added features. Uber now offers ride sharing and food delivery options, while Snapchat added augmented reality animation and professional accounts for brands. Most enterprise app development firms advise starting with a simple goal and core function, with the option of integrating additional features over time. Enterprise companies are prepared to invest heavily in a new app, but it may surprise many enterprise companies to know that investing in an app requires significant changes to your business’s existing internal IT systems. Dengel helps companies zero in on the signature function of their app and how to integrate it into the existing business. “If [a company has] to rebuild all their backend systems, it’s not going to be a three-month project; it’s going to be one year,” said Dengel. Still, leveraging existing IT systems tends to be faster than building an IT infrastructure from scratch. So, why would an app affect internal IT systems? Any backend technology or datasets you need to integrate into the app may need to be adjusted. For example, you may need to restructure databases with user information or product information to ensure compatibility with your app. You also might discover security liabilities that need to be rectified before the app development process can proceed. This process can cause development timelines to vary greatly. Although reworking your backend IT engineering may add time to your development process, the resulting app will be much stronger. To keep up with continuously evolving operating systems, trends, and security requirements, many mobile apps require near-constant updates. Raiz and Dengel both have encountered clients who are surprised to find that there are significant differences between app and product development. Dengel’s clients often think of building an app in the scheme of building a house: After a number of years of enjoying a house, it’s normal to make some routine repairs. This is especially true for enterprise companies whose apps are central to their business. For example, Facebook tests subtle tweaks to designs and features weekly, with bigger updates dropping periodically. Some apps that offer smaller perks, such as a loyalty app for a coffee shop, may be able to go several years without a major update, but more frequent security updates may be necessary. “Digital technology requires continual investment to keep up with the product,” said Raiz. Because apps require long-term investments of money and time, you should choose a development firm that understands your company’s goals and vision, brings strong technical skills to the table, and offers strong communication and collaboration. Although the classic Field of Dreams quote, “if you build it, they will come,” might come from an inspiring movie, it’s not the best advice for marketing a mobile app. With the number of apps available ever growing, the crowded market presents a challenge for companies adding a new app to the mix. When it comes to marketing your app, tried and true digital marketing strategies still apply. App development firms from around the world recommend social media (37%), paid advertising (28%), and app store presence (21%). Although the bulk of your marketing efforts will be concentrated around your app’s launch, a marketing plan and budget should be part of your thinking from the start. “If you don’t have a marketing budget at least equal to your development budget, you need to rethink that,” advises Cross. Ethervision often partners with clients’ marketing agencies to develop a full marketing plan for new apps. He points out that it may take months or years to attract users to your app. A visually appealing and compelling profile in the app store can build trust with potential users and persuade them to choose your product. First, invest in great copy for your app store profile. The copy should present a clear value proposition, illustrate important features, and explain why your app solves a problem better than its competitors. Then, provide screenshots that illustrate what makes your UX stand out. Next, monitor your reviews. These are key to securing a good spot in app store search results. Finally, ignore QR codes; they are universally the least popular promotion strategy among app development firms. Clutch found that 76% of app developers surveyed were least likely to recommend QR codes as a helpful marketing tool. In most companies, a small internal team might work closely with an app development partner for months. Colleagues who aren’t focused on the app development process might not be aware of the app’s features, or why the app was created at all. Gazdecki encounters companies that are surprised by the level of internal employee training they need before launching an app. Cross agrees, pointing out that B2C apps typically require sales team that can rally support with clients. If you choose to engage an app development partner, most will connect directly with your app marketing team or agency to develop a marketing strategy. A development partner typically offers targeted advice for crafting a story around the app, with your company’s marketing team assuming responsibility for executing a full marketing plan. Raiz looks to a company’s existing marketing strategy to guide the branding narrative around an app. To help marketing teams prepare for the launch of a new app, Raizlabs typically provides screenshots, language to describe the app’s functions and features, and suggests a direction for the marketing story. Companies or the agencies they hire can then use those resources to craft campaigns for social media, content marketing, and more. This arrangement brings out the strengths of both a marketing team and an app development team. “[The app development team] is focusing on things we’re really good at and allowing the marketing agencies to work with the customer or the internal marketing team,” said Garkavyi. As companies turn to mobile apps as a method for engaging customers, the process can prove both confusing and exhilarating. The most successful mobile apps are the result of thoughtful internal planning, focus on one signature feature, and a proactive marketing plan that builds on existing strategy. 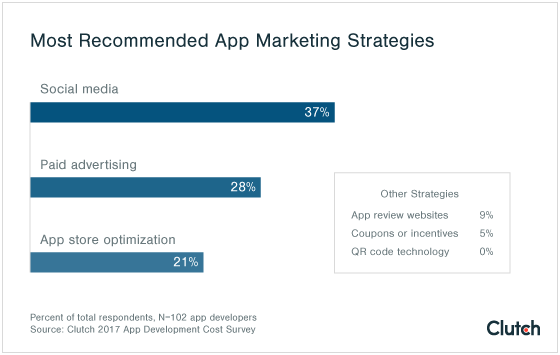 Experts recommend that app design should be guided by a company’s monetization strategy, but warn that apps that are not actively marketed will struggle to attract users in the already crowded marketplace. Finally, many companies are surprised to discover that mobiles apps require a long-term budget for regular maintenance, which ensures apps remain secure and user friendly as standards evolve. Overall, the app development process can be rewarding for companies that are prepared for a long-term commitment, collaboration, and creativity a mobile app requires. Clutch surveyed 102 app development companies across the world. The firms were asked to answer questions related to the app development process and cost based on one project completed in the past year.